Dayle and I were flying from Nairobi to Entebbe. 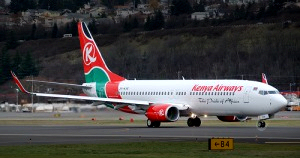 We boarded the Kenya Airways 737 and took our assigned seats. While passengers were still boarding, a gentleman approached us saying that I was in his seat. Sure enough, he produced a boarding pass on which the number of my seat disturbingly appeared. So we called an attendant to arbitrate. She studied the other man’s boarding pass a moment and then pointed out to him that it was indeed for that flight and my seat. But, there was good news! It was for a day the previous week! He began rifling through his pockets. We were witnesses to a hurried and somewhat humorous search resulting in the appearance of numerous boarding passes. They came from pants’ pockets, shirt pockets, jacket pockets, a wallet and a carry-on. This was one really frequent flyer! After scrutiny, each one was discarded. Who knows how many more were left when the right boarding pass was located – and it was not for my seat. I really wanted to know what other relics were still in those pockets. If you like this, Share it on Facebook or rate it (at the top). We are now in Accra. For our latest news, check out our news and prayer page. This entry was posted in Humor and tagged air travel, boarding pass, frequent flyer, Kenya Airways. Bookmark the permalink.